Akebono Taro (曙太郎 Akebono Tarō, born May 8, 1969 as Chad George Rowan) is a retired Sumo wrestler. Born in Hawaii, Akebono became the first non-Japanese wrestler ever to reach yokozuna, the highest rank in Sumo, on January 27, 1993. Akebono means "dawn" in Japanese. Akebono entered sumo in March 1988, at the same time as Takanohana and Wakanohana who became his great rivals as yokozuna. This entry cohort was one of the most successful ever, producing a great Ozeki, Kaio in addition to the three yokozuna. He rose rapidly through the ranks, equalling the record for the most consecutive kachikoshi (majority of wins in a sumo championship) from debut, reaching sekiwake before suffering his first makekoshi losing record. He was promoted to Juryo in March 1990 and to Makuuchi in September of the same year. In 1992, after a year of 8-7 or 7-8 records near the top of the makuuchi division, Akebono suddenly came alive with a 13-2 record in January of that year, narrowly losing the top division championship to Takanohana. A second 13-2 record two tournaments later, in May, saw him win the top division championship for the first time, and with it promotion to Ozeki. After an injury during the summer he went on to win consecutive championships in November 1992 and January 1993 to win promotion to yokozuna. Akebono was a long lived and strong yokozuna, lasting nearly eight years in the rank and winning the top division championship on a further eight occasions. His career highlights include the rare achievement of winning the top division championship in three consecutive tournaments. He also beat Takanohana and Wakanohana (brothers) in consecutive matches to win a basho when all three ended up tied at the end of the 15 day tournament. He was however quite susceptible to injury because of his height and weight. Akebono was one of the tallest sumo wrestlers ever, at 203 cm (6ft 8in) tall, and also one of the heaviest with a fighting weight around 235 kg (517 lb). Despite having long legs, considered a disadvantage in sumo as it tends to make one top heavy and susceptible to throws, he covered for this by training exceptionally hard, and using his long reach to thrust his opponents out of the dohyo (ring). In his prime, he had incredible thrusting strength and on many occasions would blast lesser wrestlers out of the ring in one or two strokes. Senshuraku (last day of the basho) was always an exciting match between Akebono and Takanohana and the Sumo arena burst with excitement, but would always go immediately silent when Akebono won. Takanohana, considered one of the great Yokozuna, matched evenly with Akebono while both were in their prime, but Takanohana gained the upper hand as Akebono's injuries took their toll. The two finished with a career record against each other that is even (15-15 against each other). In later years he also used his reach to more often grab his opponent's mawashi, or belt, and then use his weight and power to force the opponent from the ring. Akebono was often under intense scrutiny as the first foreign born yokozuna, especially after the controversy surrounding the first foreign born Ozeki, Konishiki, who came close to Yokozuna promotion in 1992. His conscientious nature ensured that he was successful in convincing most that foreigners could have the dignity to be a Yokozuna. At the opening ceremony of the 1998 Winter Olympics in Nagano, a professional sumo wrestler was chosen to represent each of the competing countries and lead them into the stadium. Akebono was given the honour of representing Japan at this event. Yokozuna Akebono is fitted with a tsuna belt for the last time at his retirement ceremony. After winning his eleventh top division title in November 2000, he suffered another injury and, after sitting out the tournament in January 2001, he decided to retire rather than face a daunting struggle back to fighting fitness. 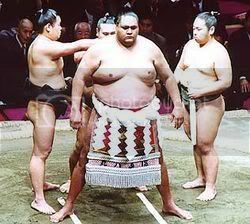 He thus was one of only a few Yokozuna to make his final competitive appearance in the ring as a championship winner. After his retirement he became a member (or elder) of the Japan Sumo Association as Akebono oyakata (trainer/parent) and worked with his former mentor in the Azumazeki stable. 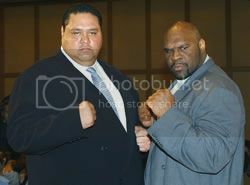 In 2003, he retired from sumo entirely to become a K-1 fighter in Japan. This decision was influenced by him becoming deep in debt due to the failure of his wife's restaurant named ZUNA (a play off of Yokozuna), located in Akasaka in Tokyo, where real estate and rent prices are some of the highest in the world. K-1 offered him a chance to clear his debt by fighting for them. His first match was on December 31, 2003 against Bob Sapp. He was knocked out in the 1st round in a one-sided affair. On December 31, 2004 he fought and lost to the legendary Brazilian Jiu-Jitsu specialist Royce Gracie in a K-1 competition. Additionally, he fought Nigerian-born Japanese television personality and mixed martial artist Bobby Ologun on New Year's Eve in 2005. Akebono fiercely attacked Ologun in the first and second round, but lost in a 3 round decision. He, therefore, is often made fun as "Makebono" ( マケボノ ) instead of "Akebono" in Japan because he continues to lose in K-1 matches. "Make" ( 負け ) means "loss" or "lose". Western MMA pundits refer to him as "Akebozo", because K-1 makes his embarrassing losses take center stage in the main event as well as Akebono repeatedly making a spectacle of himself. The name is in reference to American child culture icon Bozo the Clown. In a break his long losing streak, he was able to defeat former regular K-1 competitor turned K-1 referee Nobuaki Kakuta by decision - so far his only MMA win. Kakuta occasionally refers to this loss on variety shows when something embarrassing happens to him, exclaiming, "This is more embarrassing than losing to Akebono!" His latest K-1 bout was against Choi Hong Man at K-1 Revenge on 7/30/06 in Sapporo, Japan. He was KOed early in the 2nd round. In March 2005, Akebono and World Wrestling Entertainment (WWE) wrestler The Big Show agreed to challenge each other to a (worked) sumo match at WrestleMania 21. Akebono defeated Big Show in that match, which lasted about a minute and a half. In August 2005 Akebono announced his intention to become a full-fledged professional wrestler, and began training at the All Japan Pro Wrestling promotion dojo under Keiji Mutoh. His debut as a wrestler was August 21 in a tag team match. Yokozunas are known to have relatively short careers in professional wrestling (compare Hiroshi Wajima and Koji Kitao), so whether Akebono is successful on his merits or just as a novelty act remains to be seen. 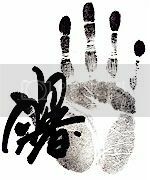 In late December 2005 Akebono announced participation in New Japan Pro Wrestling's annual January 4, 2006 Tokyo Dome card, and whether this was a one-time deal for the show (NJPW Dome cards usually bring in outside talent to attract a larger number of fans) or a long-term jump also remains unclear. He challenged IWGP Champion Brock Lesnar for the title at this event. He was defeated when Lesnar hit him with the championship belt and using a DDT. Some speculate this was because Akebono was too heavy to be hit with a Verdict (more commonly known as the F-5). However, Akebono has an announced weight of 440 pounds, and Lesnar has done the move successfully on the Big Show, who weighs in at 502 pounds. During the match at about the 1 minute mark, Lesnar seems to attempt the move, but the referee visibly waves him off from trying. Although, towards the 3rd or 4th minute of the match, Lesnar successfully lifts Akebono for the Verdict only to have Akebono thwart the move by rolling off Lesnar's back. 1 win, 11 losses (5 KO, 4 decision, 2 submission), 0 draw. Pop-punk band The McRackins wrote a song about him on their album Comic Books and Bubblegum. "Yahoo!" was initially hosted at http://akebono.stanford.edu/yahoo/ on a server named after Akebono.